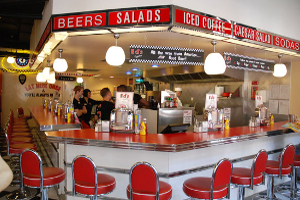 Ed's Easy Diner is an award-winning, UK restaurant group best known for its retro 1950's American Diner theme. 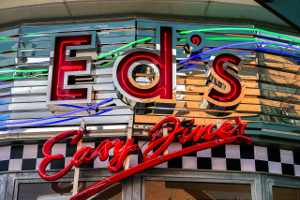 Rocking dazzling neon signage, chrome tops, red leather booths and period memorabilia, Ed's serves delicious US classics - burgers, fries, hot dogs and shakes - to the sounds of Rock-n-Roll. 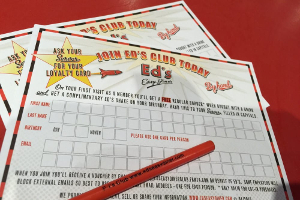 Ed's can be found in more than 35 locations nationwide and proudly counts over one million members of its loyalty club, aptly called the Ed's Club. 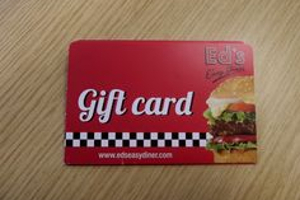 The Ed's Club offers its members 10p credit for every £1 they spend, plus a free shake on birthdays and exclusive offers all-year-round. 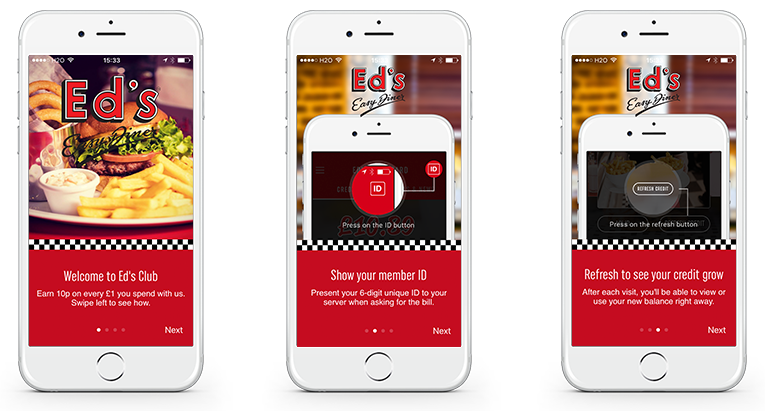 When Ed's first approached us, all you had to do to sign up to its Club was fill in a form at your local diner, activate your physical card and show it to your waiter at each visit to collect and redeem credit. It was clear that mobile was growing in importance as a channel for the business. Stampfeet positively and profoundly impacted how we engage our loyal customers, and has allowed us to build meaningful relationships with them while providing a simple and seamless brand experience, on mobile. 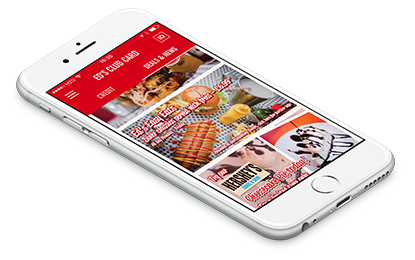 The Ed's Club app was launched on iOS and Android in the Summer, 2015. We developed a platform that scales and integrates flexibly with third parties to easily grow with the business and its requirements. New members register using a simple and short sign up form in the mobile app. Existing members simply register with their membership card number to retrieve their full account details. Everything there. From paper, to mobile. At a glance, members can find details of all available promotions - generic and individual - with the ability to deep-link to app or website pages for more information. Conveniently sorted by your nearest diner, we've recently added a new feature that lets you find your nearest delivery service as well.
" 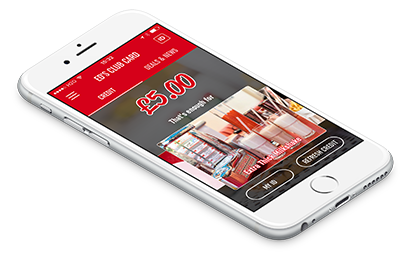 Our business grew tremendously using the application that Stampfeet has developed for us. The team was very creative and enthusiastic about building a lasting experience for our customers. " A platform that scales and integrates openly and easily to grow with the business. We've been delighted with Stampfeet. They help us effectively manage, monitor and deliver a thoughtful relationship with our most important customers. Moreover, their ongoing support as well as enhancements on the product have been outstanding. Stampfeet's commitment to its craft and client makes them a partner of choice for us, and we're excited to be working with them to deliver a brand experience our customers will love - whether on mobile, or beyond. Perhaps the greatest concern was the reaction of members to the introduction of digital loyalty, and its implications on adoption. As hoped, members took extremely well to a simple and immediate registration process, and seamless user experience. 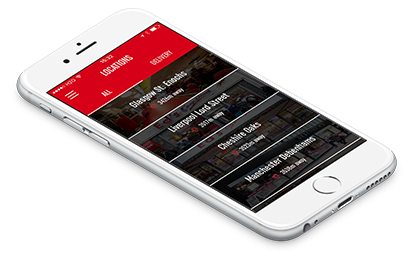 In fact, the ability to download and use the app during the same visit proved to be a key driver in onboarding and retaining fans, who were able to realise the benefits there and then, under the helpful guidance of Ed's staff. By the same token, the transition from physical card to mobile app opened the door to a new and considerable customer base: young and professional digital natives who prefer to travel light. For this particular demographic, the app has been a revelation, and likewise, has opened a new channel of communication for Ed's with a highly influential audience. 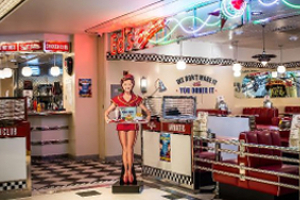 Carefully planned design and visual cues in the app has helped Ed's Easy Diner to emphasise Club benefits and rewards, in particular showing matching best-selling menu items to your available credit. By doing so, we were able to add more depth, tangibility and immediacy to the user journey, proving more effective than a simple points scheme. Deep data and reporting, from mobile and ePOS, offer Ed's tremendous insight on its customer usage and preferences. 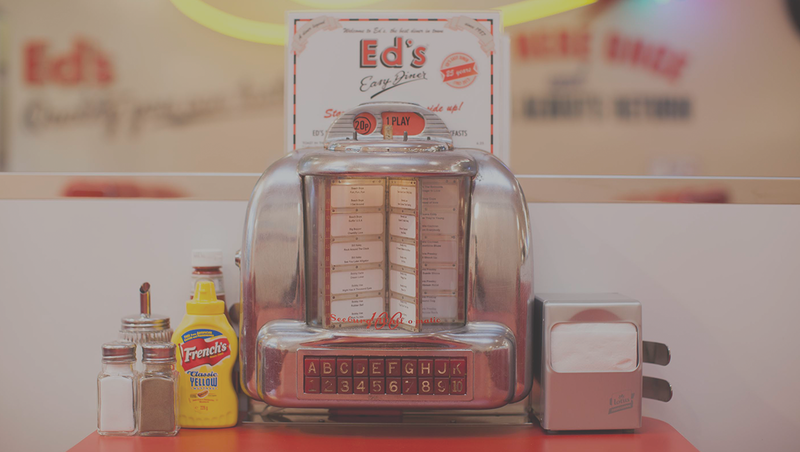 Armed with this data and the ability to contact customers across multiple channels - from email to mobile push notifications - Ed's can now run targeted communication aimed at pushing customers up the loyalty ladder. With the 'open rate' for push notifications proving higher than that of emails, using the right mix of the two has significantly improved each and every campaign. Customer feedback has also played a role in the app's early success. The ease of availability, together with the ability to capture immediate reaction has led to a constant flow of conversation with customers about positive feedback, negative feedback and general ideas for improvement. It has also provided customers with a listening ear and outlet, otherwise sought on social media or public review sites. 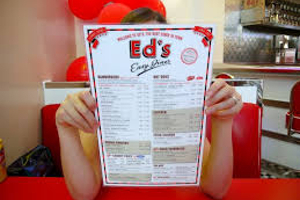 Keeping complaints in-house and private is clearly an important benefit; a swift handling of issues reinforces Ed's commitment to great customer service and its positive reputation amongst customers. Customer engagement solutions for retail and hospitality brands. Stampfeet helps operators deliver meaningful digital brand experiences that are consistent, connected and data-rich. Loyalty apps and CRM solutions for hospitality brands. Read more from us on Medium.